The plan was to play it by the books: mask up, get in, get out. Grab six bags of cash, more if we're feeling confident. We'd go in through the back, it's easy to lockpick that door. I'd take point, 'cause I can talk patrolling guards down; no shooting required....but we'll put silencers on our pistols anyway, just in case. Ideally, though, nobody will see us go in. Things hardly ever go to plan in Payday 2, the co-op first person shooter that's (mostly) about robberies. In the ten hours that I've played it, and despite criminal planning, I've yet to pull a perfect heist or mission. I suspect that most players will have a similar experience; the game is definitely not easy. Before we get into why that is, let's talk about how the game works. Players use a system called "Crimenet," where they can select a number of different missions—some normal, some more difficult versions of existing missions, and some missions that span multiple days. The harder a mission is, the more money you'll get from it (and the more likely it is you'll want to play with friends you can coordinate with). These missions can also range from straightforward bank robberies to transporting drugs, although, regardless of what the set-up is, most seem to require you to break into something, and to move high-value items to your getaway car. Once a mission is selected, players are taken to a lobby. It might be someone else's in-progress heist, which you can drop in and out of as you please. It might be your own lobby, where you can decide if you want to let other players join you or not. From there, players can also select a loadout—there are a variety of different guns, attachments, and masks to equip, along with skills and abilities depending on what you choose to spec for. You can mix and match what type specializations you have, provided you've gained enough skill points from completing missions, although you'll need to invest heavily in specific trees if you'd like to enjoy some of the high-powered abilities. Right now, at level 20, I've unlocked the ability to equip med packs, ammo packs, extra XP gain, amongst other things. I don't really have a preferred loadout, it entirely depends on what type of mission it is and what the rest of the squad's make-up is. Maybe the mission has a lot of security cameras; in that case, I'll take something to jam them. Maybe it's a particularly difficult mission, where we're likely to run out of ammo quickly—better take ammo packs! Maybe we need a person that's good at crowd control and tying civvies up. It's your call, although you can't know what a mission will require of you until you've played it a few times and see what's what. Usually, if you've got a good group going, the idea is to pull off a perfect heist...which means spending time before a game starts denoting who does what and when, along with discussing loadouts. This planning stage is when Payday 2 shines: while shoot-outs are a part of the heist fantasy, a good criminal doesn't have to resort to it, right? Thing is, there are a ton of factors that can throw a mission out the window. Bystanders will become suspicious if you run around with a mask on and a gun pulled out, naturally. A camera might catch you. Shooting is noisy. A metal detector might go off, since you're armed to the teeth. Even if you know a mission has certain obstacles, you can never fully prepare for what it holds, as things are slightly randomized. Maybe the safe of interest is in a certain room on this run, and maybe it's in a different room in the next one, for example. I laud that design choice, in that players can't just leave sneaking through up to muscle memory...but, sometimes, the way things work isn't clear and, when it comes to bystanders, situations can sometimes feel unfair. Sometimes, a civilian far away from the situation will suddenly become alerted for seemingly no reason. Sometimes, there are way more bystanders than four people can handle. And though (apparently) the sneaking mechanics are more fleshed out than in the first game, it's still a far cry from being an actual stealth game. So, more often than not, your plan goes down the drain, the police will be alerted and then will shortly appear on the scene. At that point, the game becomes a much less interesting take on horde mode, with waves of enemies raining down on you until you get a chance to escape. Most enemies are different types of law enforcement, and all seem like just bodies to shoot down. They don't seem very smart, although they do have good aim. Given that some abilities and mechanics allow you to negotiate out of a sticky situation at least to some degree—and especially coming up from games like The Last of Us. where enemies react dynamically—having dumb AI seems like a particularly noticeable shortcoming. Setting the game to a harder difficulty will give you bodies with more health to shoot down, sometimes in exasperating, ridiculous numbers (for small-time heists? ), and often while you wait for a drill to get through a door. Drilling can take minutes, which is fine, but the device will often fail mid-drill, making the entire thing feel like a chore. And there are few things like going on a rather difficult mission with lots of drilling, and then either randomly disconnecting/freezing or having explorer freeze up after I shut the game off—technical hiccups which I experienced a number of times while playing. The drilling (or general waiting for something to happen) is not so bad initially (I didn't even notice it) but as you move through more difficult missions, the number of doors you have to drill through/wait for can also feel exasperating. Granted, high-level skills give you access to other options when it comes to breaking into these doors...but it'll take a while before you get there. It's not that there's something wrong with the shooting in Payday, but there's not much that's exciting about it, either. It feels like a generic shooter, mostly because there's nothing evocative about the basic action of pulling the trigger or having bullets connect with other bodies. Personally, the shooting felt like punishment that comes from messing up a heist. Not so great, for an element that is often inevitable! Despite that, the game is good at tapping into a latent obsession for perfection; I'm still pulled in by the promise of a perfect heist. It helps that there are a ton of great ideas in the game. If you spec a certain way, you can convince enemies to put down their guns, for example. If you don't kill civilians, the police is more likely to negotiate with you—in practice, what this means is that if any player is downed and then "taken into custody," law enforcement gives you the chance to trade a hostage for that teammate. That's got to be the most creative solution for reviving teammates I've seen. You can also equip an ability where your hostages will help you out, a la Stockholm Syndrome. Beyond that collecting masks—which are collected via random drops, along with money and weapon attachments—feels more logical than collecting hats. You'll want to cover your face while doing crime, I imagine! Wearing a ridiculous hat or attire while shooting other people? Not so much. These are just some of the many awesome ideas inside the game, not all of which are fully-realized, but still, exciting to toy with. 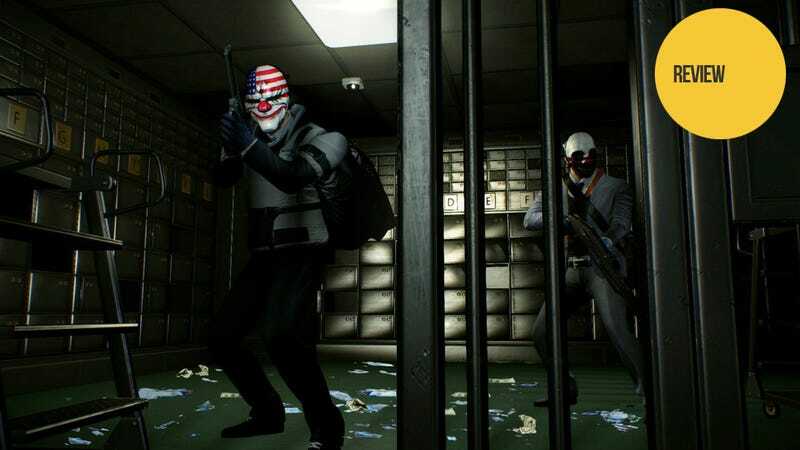 While the heist set-up is novel, and while there are few highs in multiplayer compared to the feeling of having coordinated teammates—something which Payday 2 demands—in a way, some of my enjoyment of Payday 2 hinges on what the franchise might become one day. Yes, it's worth playing now to see the neat ideas you can't find in other shooters; it's a great title to pick up to play around with your friends...but I can't help but look forward. What will Overkill make with a bigger budget? Will a sequel look nicer? Will it have wider variety of missions? Will some ideas which looked curious become more fleshed out, nuanced? I look forward to finding out, although I can tell you right now, given the ideas in Payday 2, the franchise's future looks more interesting than that of shooters like Call of Duty or Battlefield.